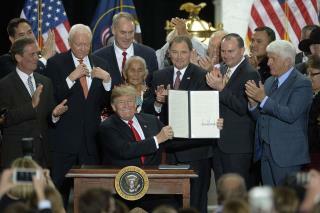 (Newser) – "The President Stole Your Land," outdoor apparel firm Patagonia declared in a message on its website Monday, hours after President Trump confirmed the shrinking of two national monuments in Utah by around 2 million acres. Patagonia says it plans to sue the Trump administration to halt what it says is an "illegal move" that will cause the "largest elimination of protected land in American history," Fortune reports. Patagonia is joining environmental and Native American groups challenging Trump's shrinking of the Bears Ears and Grand Staircase-Escalante national monuments, which he called the result of "overreach" by the Obama and Clinton administrations. The two massive monuments will be downsized into five smaller ones, with the protected Bears Ears land shrunk by 85%. hey Yvon Chouinard! How's Hollister Ranch going? Since you bought it and turned it into your kid's own private surf spot? Not exactly progressive thinking behavior there. Not sure how you pulled that off, under the guise of "protecting the environment", but well done! Thanks for not letting me drive directly to Jalama because you blocked off the road! Sparky and Patagonia are outright deceivers and liars. None of this land is being sold or even moved to state ownership. This is a topic that is being used and abused by retailers like Patagonia and REI. It all has to do with access and these 2 corporations with their sweat shops in Bangladesh want these areas as Wilderness areas, which means foot travel only. They are using this topic to sell jackets made by kids in Bangladesh. This is largely an access issue and Patagonia is being misleading at best and really is just lying. This land isn't being sold off for a parking lot. National monument designation was NEVER meant to be 100s of thousands of acres. Those are called national parks and must be voted on by congress. National monuments as well as all Executive orders live and die by who is president. Like many outdoorsman, I enjoy hiking, skiing, hunting, fishing, snowmobiling, etc. I love wilderness areas. However, about 1/2 the land in the west is owned by the federal government. Their is enough land for every type of recreation out there. Their is also room for grazing and logging. If organizations you support were not so anti-logging perhaps this wouldn't be such an issue. Logging has decreased by 75% largely because of changes in technology in the last 30 years listening to your ilk you would think it increased by that much. Patagonia is an anti-hunting and fishing company. What a crock marketing to fly-fisherman. Patagonia is a company that largely sells to Urbanites for their one weekend a year in the outdoors. These garments are for the 1% that can afford them.